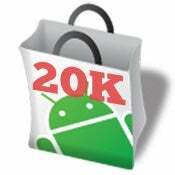 Google's mobile app store, the Android Market, has doubled in size in the last five months, and now hosts more than 20,000 applications, according to unofficial numbers from specialist portal AndroLib. While 20,000 apps is an impressive number, the Android Market runs a distant second place to Apple's App Store, which has more than 100,000 applications available for the iPhone and iPod touch. Google is narrowing the gap, though, according to AndroLib's numbers (Google doesn't disclose Android Market figures); the selection is up from a reported 12,000 titles earlier this year to 20,000 in December. Google's Android Market is a few months younger than Apple's App store, but both stores are just over one year old. Over the past year, AndroLib tracked the rate at which apps were added into the Market. The peak in activity came in November this year, concurrent with the launch of the Motorola Droid, which is expected to sell in excess of one million units this year. Almost two thirds of the apps in the Android Market are free to download (62.3 percent), with an increasing number of paid applications (37.7 percent), according to AndroLib data. For the coming year, the number of iPhone apps is predicted to grow to 300,000, while the Android Market is expected to host around 50,000. What's more, the growth of the Android Market is predicted to be sustained in 2010, when an increasing number of Google Android devices. We have seen several models released this year (highlights are Motorola Droid, Sprint Hero, Droid Eris), with more to come next year from the likes of Sony Ericsson and Acer. However, the major smartphone platform battle in 2010 won't be between Apple and Google, but between Microsoft and Google. Microsoft's Windows Mobile operating system has seen a decrease in popularity recently and Google's free-to-license model for Android has been slowly eroding from Microsoft's market share. Google is also expected to launch next year its own, carrier-free Android smartphone, the Nexus One. The phone is believed to sell directly to consumers, with customers allowed to select their carrier of choice when purchasing. T-Mobile is also believed to have some kind of role in the launch, but the details are very sketchy at the moment.